Her mother and father were both painters and designers, so they greatly influenced her first artistic endeavours. Later, the work of artists like Duncan Grant and Eric Ravilious, provided powerful inspiration. She was, however, influenced by more than just painting; the varied artists of the Omega workshop, printmaking, decorative porcelain, fabrics and fireplaces, together with screens created by Grant also motivated her work. At Putney High School she won the mural prize. Later, at Norwich School of Art, she studied wood engraving and created a number of large collage murals. She studied at Ravensbourne Art School and later at the Royal Academy, where she won the landscape Prize. It was here that her work caught the admiration of her tutor William Scott. She won the Prix de Rome Scholarship at the Royal Academy. Anna taught at Hornsey College of Art and at Ravensbourne Art College. Since the 1980's Anna has painted all over London and in various parts of the Mediterranean, most recently in France and Italy. This exhibition is in part a celebration of the influence her father had over her work and in part a celebration of his unique contribution to the anti-nuclear and peace movements everywhere. 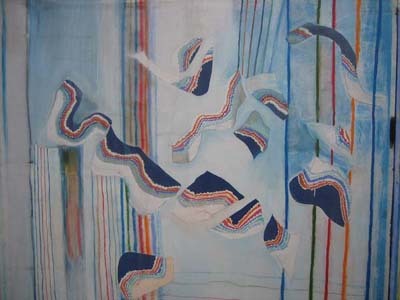 Anna Scott, Floating Space, Acrylic on Canvas. 77" x 72"